We’ve seen a spate of Robert Weaver-related postings and comments here at Graphic Tales, and I wanted to round things up a bit and engage a question or two about visual patrimonies in illustration. In particular, you may have read a spirited back-and-forth in comment threads about the relationship of Weaver to other artists and illustrators, both qualitatively and stylistically. This is the sort of thing that lends itself to blogging, insofar as you can explicate such claims pretty directly while steering clear of bigger problems. So let’s have a go. The indefatigable and opinionated David Apatoff has departed by degrees from he sees as the Robert Weaver Appreciation Society. 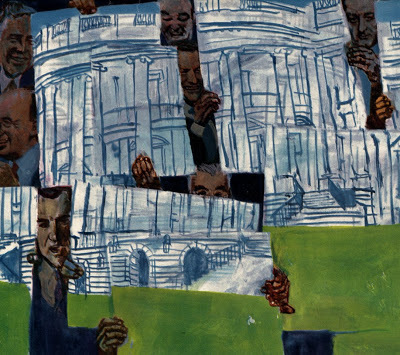 Among the ideas that David brought forward in his initial comment about the Super Tuesday post on Weaver and Kennedy: For me, Weaver's style in the Kennedy series for Esquire largely emulated the then-fashionable work of "fine artist" Larry Rivers. Illustrator and blogger Bill Koeb took some exception to this, citing what he saw as Apatoff’s criticism of Weaver by said association. Moreover, he added, I think you are confusing style with technique. I see similarities between the two, but also between Weaver and Schiele, Cezanne, and many others. Apatoff replied: Bill, I didn't consider my reference to Larry Rivers to be a "jab" at Weaver. I like Rivers, and consider some of his work to be superior to Weaver's. I think it is obvious that Weaver liked him too. So what about Larry Rivers? Michael Kimmelman’s New York Times obituary (August 16, 2002) provides a host of tasty biographical details: he began his creative life as a Ukranian-American saxophone player named Yitzroch Loiza Grossberg. He was rechristened “Larry Rivers” by a comedian in the Catskills, studied music and smoked dope with Miles Davis, learned painting from Hans Hoffman, acted in a film narrated by Jack Kerouac, and designed sets and costumed for a Metropolitan Opera performance of Oedipus Rex. Kimmelman does not oversell Rivers’ achievements as a painter, but notes that Rivers created an important bridge between the Abstract Expressionists and the Pop artists. These are the works which David Apatoff seeks to establish as an influence to Weaver. Does this claim hold up? The painting is a loosely organized and somewhat campy restatement of an old tradition. It provided a bit of tweakery to the Abstract Expressionists who had come to dominate American painting, and in that regard would have provided some comfort to the emerging Manhattanite tradition of Postwar “Expressionist” illustration later squarely identified with Weaver. The Greenbergian dominance of painting-about-paint notions of advanced art foreclosed certain kinds of careers for young figurative painters in the 1950s. Many such people became illustrators instead, Weaver among them. Larry Rivers challenged that dominance, partly through his cheeky tone, and partly through his investment in figuration. The balance can be difficult to decipher, which is why Rivers’ legacy may not be sure beyond transitional footnotes. Like many of the people who became significant players in Pop art, Rivers invested in the creation of surfaces. I mean this both in the visual and theoretical sense. The repainted Dutch Masters labels, Camel cigarette packs, and mock-informational works that Rivers produced during the 50s through the 70s betray an investment in the idea of superficiality, which in Rivers’ case is undercut by the painterliness of his touch. The cookie-cutter cunning of Warhol’s Brillo boxes, for example, is missing from Rivers’ more wistful takes on standardization and repetition. But these are flat things, atmospheres aside. The surface of the painting doubles as the surface of the image. There is more to say about this, but the basic point stands. More study of Robert Weaver’s career will be required to identify the touchstones of his early visual and personal investigations. But beyond the potentially inspirational example of Rivers early work, the mature Weaver is after something else. Weaver also invested in the idea of surfaces, and did so with more than a passing awareness of Pop. But in his case, there is no theoretical engagement with flatness in the Greenbergian sense. Weaver sees surfaces everywhere, and he is alert to the cultural threat such surfaces may pose to the individual. He is eager to expose the superstructures which undergird these surfaces. All the contraptions of display and elements of signage in Weaver bear our attention. It is quite possible to subject Robert Weaver to a thoroughgoing postmodern reading. On the whole, such exercises run out of gas after a paragraph or six, but miracles never cease. In the meantime, from my perspective I think it plain that Weaver was aware of the emergence of Pop and its implications, likely would have seen Rivers as a notable figure in the mid 1950s. But Weaver’s engagement with reportage required him to invest in spatial depiction of far greater sophistication and range than Rivers needed past a certain point. Weaver’s use of signage, reflection, printed surfaces, and photocollage suggests more than a passing engagement with the ideas running through Pop, although he may well have accessed those ideas through the process of observation and reflection that were so basic to his process. He took words and images very seriously, and he was quite willing to use them against their authors.